Weather forecasts are on phones, television, computers...we need them to plan our day or simply to know what to wear. They provide essential information for planting and harvesting crop, for selecting routes over land, sea and air, for building roads and infrastructure, for making preparations against impending natural hazards, and for much more. WMO coordinates the worldwide efforts that are prerequisite for the production of accurate and timely weather forecasts. Weather satellites can observe weather systems on a global scale. There are some 160 meteorological satellites in orbit today, creating about 80 million satellite observations per day. Sensors on weather satellites scan the Earth, taking measurements of reflected light and infrared temperatures. These measurements are then digitized and sent back to Earth where they can be turned into images. 1. Polar-orbiting satellites orbit at low-altitude around the North or South Pole and monitor the entire planet over the course of 10 days to 1 month. The information and data from these satellites are used in weather forecasting. 2. Geostationary satellites orbit at high-altitude at the equator, at the same speed as the Earth’s rotation, continuously monitoring one section of Earth. These satellites can track cloud formations and large storms as well as fires, etc. How do we monitor the weather from space? 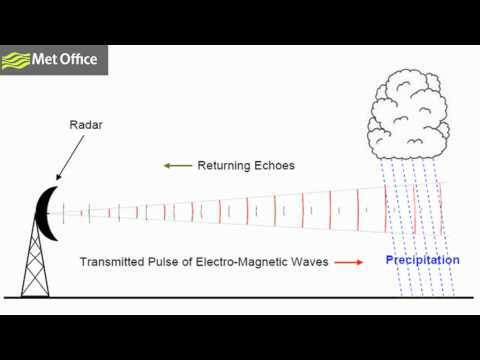 Doppler radar (or weather radar) tracks precipitation – rain, snow, hail, etc. It calculates the motion and intensity of the precipitation, and also how likely it is to turn into a severe storm. A Dopper radar is an electronic instrument that sends out radio waves from its antenna. Objects in the air like raindrops, snow crystals, etc. reflect some of the radio waves back to the antenna. Then the instrument converts the reflected radio waves into pictures to show the location and intensity of the precipitation. Radio waves bounce off all objects, including insects, buildings, trees and mountains. Meteorologists have to take this into account when reading the radar pictures. Around the world – on land and on sea, from polar regions to mountain tops – there are tens of thousands of weather stations taking observations of the current weather, atmospheric and climatic conditions. Observations are taken multiple times per day from each station. The data from weather stations help to generate forecast models. WMO gets its information mostly from the weather stations that are operated by the national weather services of its Members. But you too could also own and operate your own personal weather station. This station could be just for your enjoyment...or depending on your country, it could be connected by Internet to your national weather service in order to share data. Weather balloons carry something called a radiosonde into the upper atmosphere. Radiosondes measure atmospheric conditions such as barometric pressure, relative humidity, temperature, and the direction and speed of winds, and send the data back to an upper-air observation station on the ground via a radio. The data collected helps to make long-term weather forecasts and to monitor atmospheric phenomena like ozone depletion. Radiosondes can also be dropped out of aircraft – these are usually called dropsondes. A rubber or latex balloon, carrying a radiosonde, is filled with helium or hydrogen – gases that are lighter than air. As the balloon rises, the pressure of the atmosphere decreases, causing the balloon to expand. At some point high up in the atmosphere, the balloon will break, causing the radiosonde to fall back down to the ground. If recovered, the radiosonde can be reconditioned and used again. Data on the weather are collected everyday from weather satellites, Doppler radar, weather stations, weather balloons, and other sources such as aircraft and ships. It then needs to be processed and turned into something that we can understand. Computers, of course, do that work. Computers process the data based on numerical models that scientists have developed (and continue to develop) from what they have learned about the laws of nature and physics. Taking the data on current weather, climate and atmospheric conditions, computers use these scientific models to help forecast the weather for the coming days.